Thanks to a D-League Diary interview with Rick Rickert, we have a more complete and honest picture of what happened from his perspective prior to the 2004-05 season. 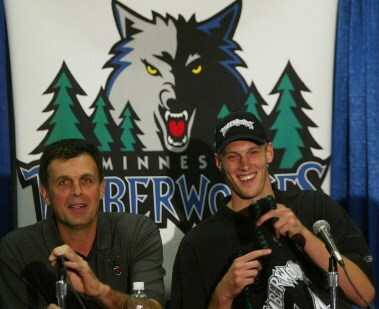 At Timberwolves media day before the 2004-05 season — which we didn’t know at the time was the beginning of the end, or at least the beginning of an endless string of rebuilding projects — the hot topic was an offseason punch Kevin Garnett was said to have thrown at former Gopher and Duluth East prep star Rick Rickert, a second-round draft pick of the Wolves in 2003. I wasn’t there, but looking back in retrospect one can imagine this was some pretty serious public relations spin. That’s not to say I even blame the Wolves for trying to project their version of the story. It’s just to say that’s the way these things happen. So the KG-Rickert punch became, over the past decade, the stuff of part truth, myth and legend — referred to as fact even though nobody quite knew what really happened. When it was the early 90’s it was definitely Michael Jordan, but as I got a little bit older it was Kevin Garnett. Obviously that changed a little bit later on in life. Not much of this really matters in the grand scheme of things now. It’s just always interesting how the versions of these stories change when there’s no longer anything at stake.